Measurements: 3.4 x 5 inches; or 85 x 128 millimeters. Back of card: Solid pale green with abstract Indian design in white in center. Book included: Yes, 192 pages, 6 x 9 inches; or 150 x 230 millimeters. Publisher: Destiny Books. Printed in the U.S. Comments: Cards are numbered, 0 - 49. O is the Source. Cards 1 - 16 are the 16 Great Mysteries, divided into Superiors, Associates, Subordinates & Inferiors. Cards 17 - 24 are the Supernaturals. The remaining 25 cards are Elements of the Sweat Lodge. Inspired by the ancient Lakota ritual of healing & purification known as the sacred Inipi (sweat lodge ceremony). Believed to have been brought to the people by Kanka, Old Woman Sorceress in order to purify the body & spirit. Sitting in the sweat lodge, an improvised womb of Mother Earth, you may experience an expanded vision of your being & purpose as well as an intimate sense of walking in balance between the conscious world & the world of spirit. 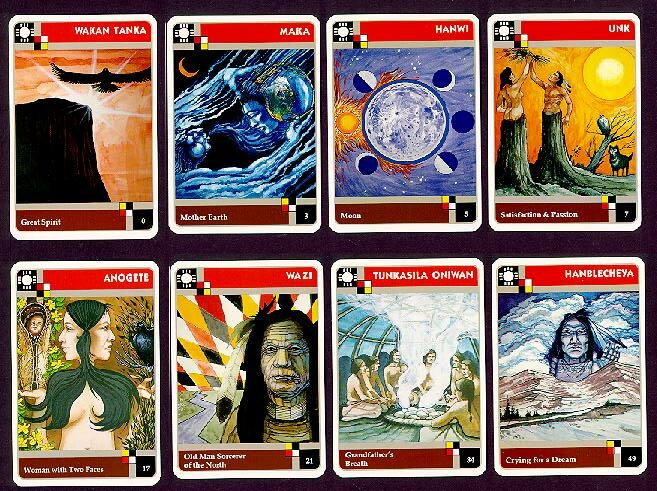 Through the use of these divinatory symbols, the Lakota Sweat Lodge Cards draw powerful images & teachings from the Inipi to rekindle the spirit of this ancient ceremony. - Notes adapted from the back of the box.